HEAT olive oil on medium heat in sauce pan. POUR onion, pepper, celery and zucchini in pan. Saute for 8 minutes or until onions are translucent. 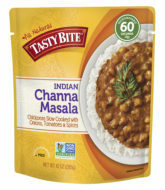 ADD chili powder, Tasty Bite® Channa Masala, Tasty Bite® Madras Lentils™, tomatoes and vegetable broth and simmer for 10 minutes. Top, as desired, with cheese and sour cream.